• If you and your pet are traveling by air, keep in mind that most airlines now only accept pets prepared by professional transport companies who are aware of the shipping regulations, the use of approved crates and equipment, and proper filing of paperwork. For more information, visit The Independent Pet and Animal Transport Association International website at http://www.ipata.com. 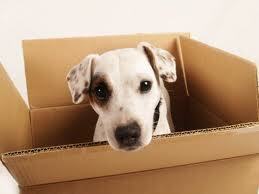 1) Take your dog on a walk around the block of your new neighborhood before entering your new home. Your dog can check out the smells of his new neighborhood and get some pent up energy out. 2) Check your energy. If you are feeling tense or worried about the move your dog will pick up on that and become anxious themselves. Deep breathing folks!